Search Engine Optimization is often touted by SEO agencies, and marketers, as the solution for your online failings. Sometimes the promises are clearly ridiculous, sometimes they’re more realistic. Sometimes the promises are even fulfilled. But let’s get real in this article, will search engine optimization solve your business issues? No. Not alone. It is only one tool within a greater strategy. 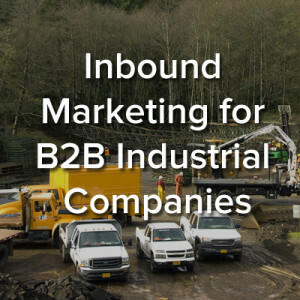 Inbound marketing for B2B industrial companies is a holistic online marketing strategy that pulls together scattered tactics and focuses on building a system that attracts qualified visitors to your website, converts visitors into leads in your sales funnel, nurtures those leads to a sale-ready stage, and delights your customers post-sale to keep them coming back for more. The way that people build trust and arrive at a purchase decision has changed. The rise of Google as a household verb has flipped the traditional buying cycle on its head. It has become increasingly difficult to gain a direct line to the decision maker. Humans are getting really good at blocking out the traditional marketing playbook. Traditional tactics that used to produce results like cold calling, direct mail, trade publications, PPC ads, and even email blasts have been countered with caller ID, DVR systems, ad blocker software, and smart email inboxes. The problem is that these outbound techniques interrupt our lives. They keep us from completing what we want to be doing, like reading an industry article or watching a TV show. If you’re going to continue to use a marketing strategy that annoys people, you’re going to see your ROI continue to shrink and your message will be falling on deaf ears, or worse, you will actually achieve negative ROI by upsetting existing customers. Instead of contacting sales, people are going to Google to find answers. The average B2B prospect has completed 57% of the buying process before they even contact sales. If they are looking for a recommendation, they’re going to a LinkedIn group of their trusted peers. Below we break down the step-by-step inbound marketing process that positions your company to be found online by perspective B2B buyers. By developing a laser-like focus on your customer and their unique pains, you can begin to build trust in the eyes of the consumer. A digital brochure as your website is no longer enough. A smart website is a hub of educational content that helps customers throughout the buying process. To put the icing on the cake, inbound marketing has been proven to deliver leads at a cost 60% less than traditional marketing efforts. The process begins by creating quality content. Quality content is helpful and relevant to the pains that potential customers are facing. This content serves as a magnet that attracts visitors to your website for the first time and keeps them coming back for more. First-time visitors come from a variety of sources: a search from Google, a direct visit from a word-of-mouth referral, a post to LinkedIn, or a link in a tweet. Once they come to your website, it is the quality and the relevance of your content that is going to keep them reading additional posts and pages. Start a blog on your website domain, yourcompany.com/blog. This will position your website as the hub of content. Write blog posts that simply answer questions that your potential customers are already asking. Use LinkedIn Groups and Twitter chats to share helpful content with the world. Use Calls to Action in your blog posts that direct readers to download more in-depth, relevant, and helpful information. Once visitors are on your website, proper context personalizes their experience and pulls them through your sales funnel. To collect new business opportunities, you need to get their permission to start communicating with them. Content marketing offers like eBooks, special industry reports, and case studies give potential customers an opportunity to learn more about possible solutions to their problems. These offers allow people to dig a little deeper and gather more information about the appropriate solution. By downloading a content offer, you have converted a visitor into a lead in your marketing database. There’s now an opportunity to expand the relationship. Continue to share additional content and qualify the opportunity based on the actions they take. Create helpful content offers like buying guides, eBooks, industry reports that will help. Use landing pages and forms that allow visitors to download your content. Connect your forms and landing pages with a marketing database like Hubspot or Infusionsoft. Inbound marketing helps to make sales teams more efficient. By spending less time following up with unqualified leads, sales people are able to spend their time working with people who have already engaged with the content on the website. At their core, leads from inbound marketing are different from outbound leads. They have gone through the online sales qualification process and are more educated than an outbound lead. They have done their research and have a clear understanding of the pain they are facing. It is now the salesperson’s job to serve as a resource to help identify the best solution for the lead’s problems. Use lead nurturing to follow up with your leads after they download your content and share links to more helpful content. Implement lead scoring to help separate the qualified leads from the unqualified leads in your marketing database. Use email marketing to share your latest content offers with your leads and customers. Marketing doesn’t end after the sale is closed. After a customer is closed, it is time to make them so happy that they start telling their friends about you. Inbound marketing helps streamline this communication. It allows you to share additional content that helps them do more and better business. Use lead nurturing to follow up with customers and keep them engaged with your brand. Listen and connect with your customers on social media. Utilize website personalization to better meet your customers needs. To reiterate the beginning of this article, search engine optimization is a central component of a smart online marketing strategy. However, it is not within itself a strategy. By applying inbound marketing methods to your company’s marketing strategy you can begin to capitalize on the rising B2B buying shift. This shift yields amazing growth potential for companies who embrace the new type of buyer. We hope that the above steps will help you begin creating marketing that your prospects love, content they can’t live without, and ultimately new business relationships that last for years to come. This post originally appeared on The Pittsburgh Technology Council’s blog.